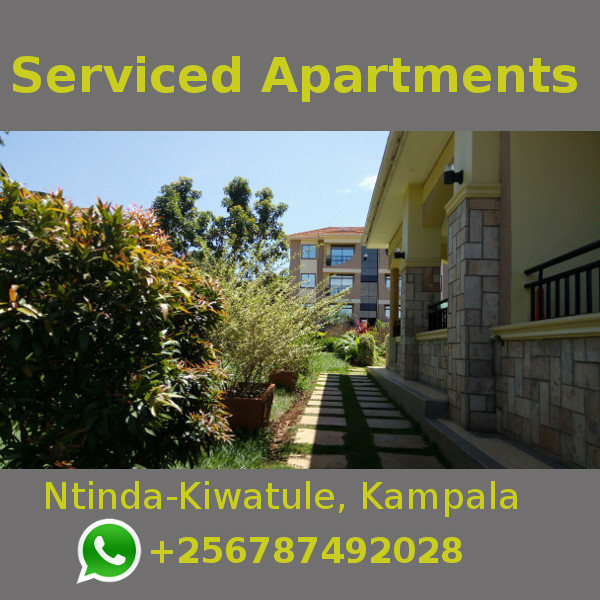 Kampala had waited a long time for their homecoming. They had year-in year-out promised to stage a show back home but in vain, creating speculation they were in the UK illegally. 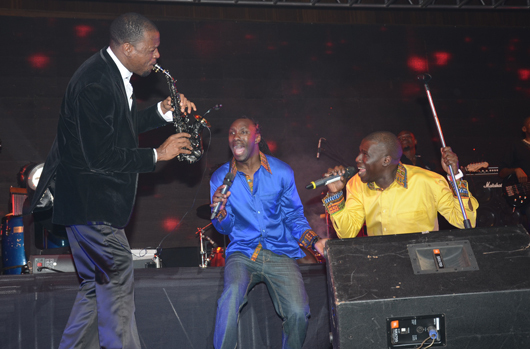 However, last Friday, Ganda Boys formerly known as Da Twins were in town and put up a spirited show at the Kampala Serena hotel. 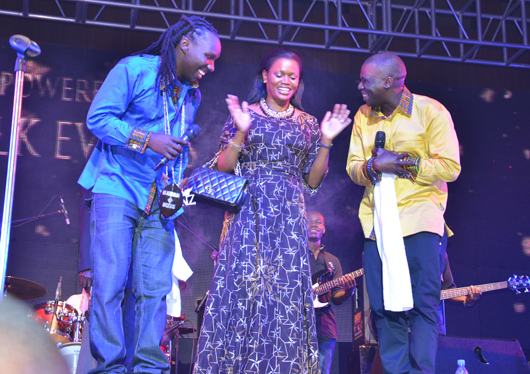 The show, which attracted Nnaabagereka Sylvia Nagginda as the chief guest, set the bar high for Ugandan musicians thanks to their new found band leader, Craig Pruess. This brother who comes with a wealth of knowledge in music knows how to choose his team. And his multitasking skills are amazing. Craig has an eye for rich music and it was evident on stage. As he switched from the trumpets, acoustic guitar to the keyboard; he also served his soothing voice as a backup vocalist together with three stunning female vocalists. Then there was this whole range of instrumentalists with two whites; one on the lead guitar and another on the trombone. There was the bassist, drum player, percussionist, and rhythm guitarist. The stage, with that huge backdrop screen, the lighting and sound, was awesome – thanks to Silk Events. The boys, Denis Muggaga and Daniel Sewagudde, stormed the stage at 8pm donned in yellow and blue African shirts respectively, courtesy of Arapapa. They started off with the new style of music they do today, which trades between blues, rock and rooted music. And it was more of a listening session with tracks such as It’s Good To Be Back Home, Njagala, Forgetting People, Birds of Africa, United Africa, Lumonde, Freedom, War in Africa, One Love, Mugga and Jinja Road. Maama, which had the Kiganda drums, put the musicians to another level. “I wish Ugandan musicians were in attendance to see how a show is organized, because the boys have set a standard that should be emulated,” noted Aloysius Matovu Junior, a producer and musician. Since it was a charity concert for the Nnaabagereka Development Foundation, there was a fundraising during the break to support maternal health in two districts; Buikwe and Mityana. Over Shs 40m was raised in cash and pledges. Buganda Parliament caucus raised Shs 12m, Godfrey Kirumira and Habib Kagimu Shs 10m, Zari ‘Boss Lady’ Shs 5m, Lord Mayor Erias Lukwago Shs 2m, MMAKS Advocates Shs 5m, NSSF Shs 5m, Roofings Shs 2m, Monitor Publications Shs 2m and Kampala International Medical Centre Shs 1m, among others. “Maama [Nnaabagereka] has a big heart. She wants everyone to live a better life, that is why she is tirelessly giving a hand to mothers and children,” said Mugagga. The show hosted by Isaiah Katumwa closed at midnight with songs that drove the Ganda Boys into the limelight such as Midomo Midomo that left the entire audience on their feet dancing, save for Prince David Wasajja, Prince Kiweewa Jjunju, Nnaabagereka and her table occupants that had finance minister Maria Kiwanuka. To show her excitement to the beautiful music played, Nnaabagereka joined the UK-based boys on stage for a handshake as the curtains came down.